Spring is here, which means an egg in every bird’s nest. 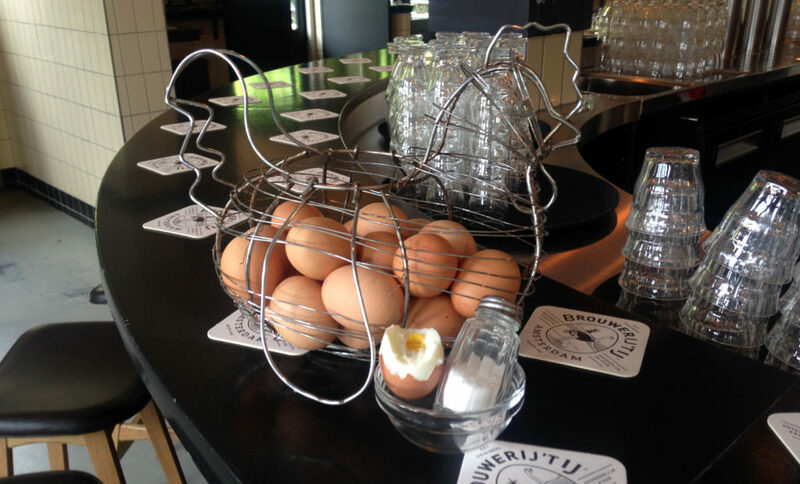 The pub in our brewery offers freshly boiled eggs all year around. This is an old tradition in bars in Amsterdam, one that surprises locals and tourists alike. How did these boiled eggs get there? The origin of the basket of eggs on the bar is not quite clear. Some say the tradition ‘hatched’ in 18th century France. It was illegal to sell alcohol without offering food and at the same time there was a surplus of eggs in the country. English pubs and American saloons offered free boiled eggs in the 1800s, while our neighbors in Germany supplied their customers with pickled eggs. They proved a relatively cheap and filling snack while making the customer thirstier (the same with extra salty peanuts and chips). You can lay them out for a day or two (or three) without any problems and they come with their own packaging. Not unimportantly: a customer will seldom eat more than two eggs so the risk of overindulgence of the free lunch is minimal. No wonder, in short, that they soon appeared in Dutch pubs as well. In the late 19th century gave birth to a new social order with the Industrial Revolution and its laborers. The men drank away their misery at the local bar where they happily ate a free egg. These wretches would rather spend their earnings on liquor and beers than on food and this way the patron made sure he wouldn’t spend all night cleaning up vomit or break his back throwing out wasted customers. In several places in Amsterdam we were served three eggs at a time. Is this usual – and if so, why? Is it tradition? Did you come with two other people, perhaps? Not a tradition as far as we know. Did they give you beer too?